The Keto 90 CEO Mega Pak™ includes nutritional products, spices, and everything you need to successfully follow the high-fat, low, carb Keto 90 program in the Better Health Challenge. 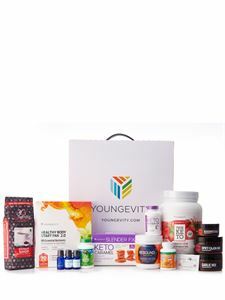 Plus, we have crafted this CEO Pak to include some of our most popular products to help jump start your Youngevity opportunity. Slender FX™ Keto Caramel Weight Management Bars - filling and satisfying, these bars deliver the energy and essential nutrients you need to sail through a low carb diet. The perfect snack when following the Keto 90 program. Slender FX™ TrueKeto Strawberry Crème Shake – this shake delivers an exceptional macronutrient profile that is perfect for a true ketogenic diet and essential for the Keto 90 program. Slender FX™ Keto Power Up™ - this all-natural blend of metabolism-boosting nutrients may promote energy production and support healthy weight management as a part of a healthy diet. Ultimate Mineral Caps™ - replenish minerals you may be missing from a high fat, low car diet. This blend contains a natural assortment of trace minerals derived from prehistoric plants. Pollen Burst Tabs – this herbal formula promotes natural energy (SOD) and endurance without caffeine.